Do the Celtics Have an Identity Issue? We are about a month into the NBA season and the Boston Celtics do not don the record most basketball fans would have guessed at this point. After another loss over the weekend the team is staring at a record barely above .500. This time last year they had already gotten through the Gordon Hayward injury and were on a roll. On November 14, 2017, the C’s had a 13-2 record and everyone here in Boston was beginning to think championship. Even though they had lost their prized off season free agent signing, the team was operating at such a high level. Brad Stevens and company were creating an early season buzz. Fans were starting to think that the sky was the limit for this exciting young team. Boston would go onto play Lebron James and the Cavaliers with a chance to make it to the NBA Finals. The end result wasn’t what neither the team, nor the fans would have hoped, but there was a clear silver lining to the loss. The Celtics took the Cavs to a Game 7 and had some key moments that they could absolutely build off of. Everyone remembers Jayson Tatum dunking on Lebron sending the Game 7 home crowd into a frenzy. You always want to see your favorite team win their last game (shout out to the 2018 World Series Champion Boston Red Sox! 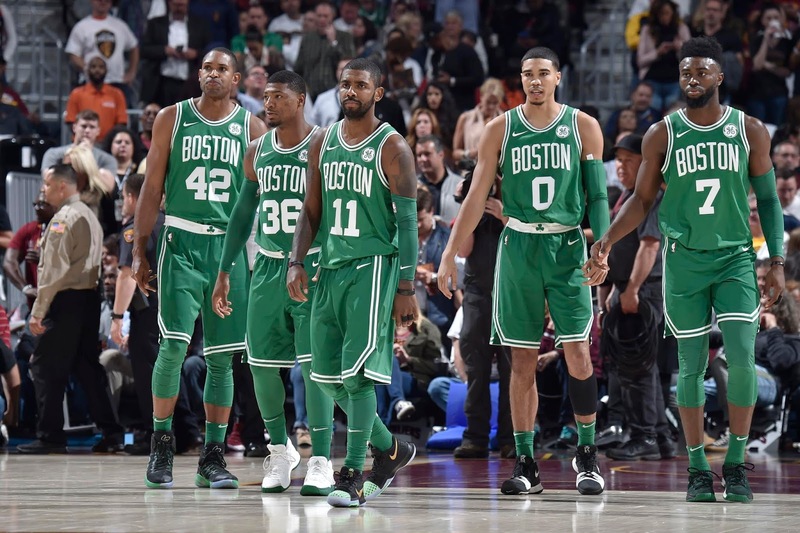 ), and even though the Celtics were not going to play in the Finals, fans and basketball critics alike were all able to see the potential this team has. Not to mention, that by the end of the season the Celtics were playing without Gordon Hayward, Daniel Theis and Kyrie Irvng, and they were still able to be a game away from playing for a chance to win it all. When the 2018-2019 season began the basketball community was excited to see what this young electric team would look like with a healthy Kyrie and Hayward. Flash to opening night and the Celtics looked every bit as good as they were touted to be. The hometown fans were able to witness a decisive victory over the rival Philadelphia 76ers. Boston looked like they were coming out guns blazing ready to take on the entire league. Kyrie Irving and Gordon Hayward only scored 17 combined points but the C’s still won the game running away. Tatum’s offseason work with Kobe Bryant was looking like it was going to pay off in spades. Right out of the gate fans all over were ready to sit back and watch this team steamroll their competition. I won’t lie to you, I was one of them. I was already convinced, after 1 game, that this team was going to take on the Golden State Warriors in this year’s final. Welp, maybe I may have gotten a bit overzealous. We are well into the month of November and this team just doesn’t have that pizzazz that I thought they would. After the first game, if you asked me what I thought their record would be 13 games, in I may have been crazy enough to say 13-0, 12-1, not 7-6. Barely over .500, but here we are. In my opinion, this team is dealing with an identity problem. I don’t think that this team will be a bust. I believe that Brad Stevens is a good enough coach and they have the talent to right the ship. But something is a tad off. The team doesn’t have the same mojo that they played with last season. Going into last year, the Celtics were being billed as the league’s next big three. Irving, Horford and Hayward were the stars and they would be backed by up and coming young talent. As the season went along things began to change. Jayson Tatum was looking like a veteran as opposed to a teenager, Marcus Smart became a meh shooter as opposed to a bad one, and when Irving was out Terry Rozier was able to fill in almost seamlessly. The NBA world was anticipating the next great big three that was supposed to be led by the “fireworks” ownership had always promised, but instead they were witnessing the league’s next great young team. The veteran players were obviously tremendous contributors, but the youth were propelling this team forward. I think it is possible that players aren’t filling the roles that they need to if they want to win, but instead they are all trying to be “the guy.” Throughout the off season it was just assumed that this team would gel and finally make it to the Finals. I think this dynamic is the issue they need to clear up if they want to truly compete for a title. We have always known that Brad Stevens could get the most out of players. He has an i000ncredible ability to get the absolute most out of players on his team. But there has been 1 question that hasn’t entirely been answered. Can he manage egos and mesh today’s stars with the stars of tomorrow? Ultimately I think he can but it won’t be easy. In the off season you couldn’t even utter the words Boston Celtics without being told about Tatum’s work with Kobe. For the record, I loved it, I think Kobe was the last of the true killers on offense so I am all for Bryant’s tutelage. You also heard Jaylen Brown’s championship aspirations muttered around a hundred times. 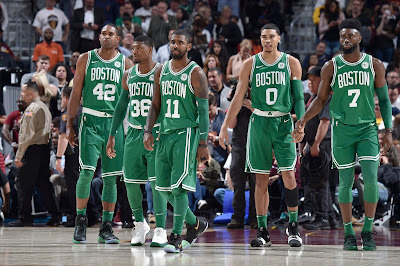 From the writing on the wall, I don’t think I’m crazy to think that the younger players believe they are the ones to lead Boston to title number 18. The cockiness or confidence, however you want to describe it, has carried into the season. We haven’t even made it to Thanksgiving and there are rumblings around the league that Terry Rozier is unhappy with his playing minutes and may want out. If that is true that is never a good vibe to have in the locker room. On the court you’re seeing Brown take shots that aren’t high quality and he could be throwing this offensive scheme out of whack. It will be important for these players to understand that they have a role to fill. Stevens has to reel in the egos of some of the young guys and get them to buy back in to the efficient offense that they utilized last year. The vets aren’t blameless in their early season struggles. Al Horford has not been as effective as he was last year, point blank period. (I have always wanted to say that “point blank period”) He is getting older and may have lost a step, but he is a pro’s pro and will find a way to continue to help this team. It is not easy for a former All-Star to become a role player, but that may be Horford’s role for this year’s team. Kyrie Irving is playing at a high level, but I do find it concerning that he wants the team to bring in another vet to help with the mind set on the team. As of right now, this is Irving’s team. He has a ring and is the best player on the floor. He needs to be that leader. He needs to give a winning perspective to the team as a whole. I do wonder if the younger guys don’t always listen to what he has to say because of their achievements last year without him. Regardless of what I think, Irving can make this team his. As for Gordon Hayward, I think he just needs to continue to build confidence after suffering such a horrific injury. He may need to take a back seat for the time being and lead the second unit until he is fully back. No one is going to blame Hayward for taking some time to get fully comfortable with the offense. When Gordon settles into the offensive scheme I think it will help a lot with their productions and efficiency. Don’t get me wrong, I do NOT believe this is a divided locker room. I don’t think that there is any hostility or anger behind the scenes. I just think that this team is struggling with their on-court chemistry. Getting Hayward back into the swing of things is going to take some time but I think it will work out in the end. What could possibly fix this dynamic issue? I don’t believe this to be the case but maybe Kyrie was right and this team could use some extra locker room leaders could help. Kyrie recently mentioned that this team could use a “15 year… 14 year vet” that would “help us understand it’s a long marathon rather than just a full-on sprint.” Most (including myself) would argue that Irving or Horford would be that guy, but maybe this roster could benefit from a grizzled vet. When Irving was competing for championships in Cleveland they had Richard Jefferson on the roster. He didn’t play an awful lot but perhaps he was a key moral guy in the club house. There are always players on championship teams that contribute off the field of play way more than they do on. I’d prefer that player to be on the current roster. After a recent loss, Marcus Smart was said to have given the team a bit of a pep talk. Maybe that desired leadership will end up coming from within. However it ends up happening, I think Stevens, Ainge and the vets on this team will get this squad back on the championship path. So have no fear Celtics fans…I think you will be watching this team play deep into the playoffs. This team is just too good to flounder like this. They have way too much talent and have one of the best coaches in the NBA. Things will get better. Maybe they will follow the Red Sox lead and go get a ring. 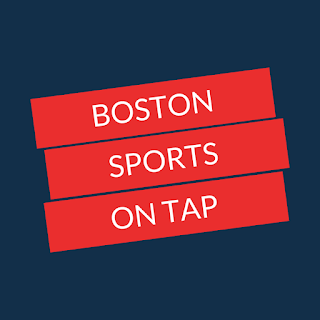 Please show some love, Boston Sports on Tap is amazing.